Inspiro, in the words of its enthusiastic developers, is an “imagination generator”. What that means exactly is a little unclear, but what we do know is that Inspiro does try very hard to be very deep. In less fluffy terms, Inspiro is a random word/phrase generator. You push the red button and it spits out linguistic nonsense that our brains then try to make sense of. It’s effectively the old creative exercise of plucking words out of a hat, but it’s a little more comprehensive and efficient. Just don’t expect this to turn you into a creative genius overnight. 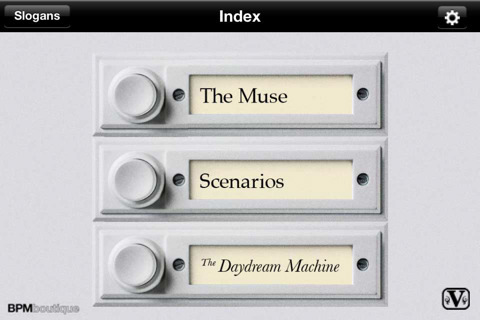 Depending on what kind of random mental stimulation you’re looking for, there are three different modes to help suit your needs: Muse, Scenario, and The Daydream Machine. 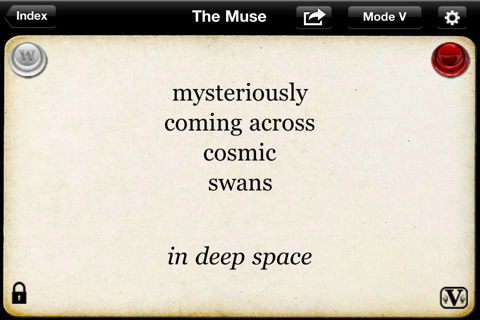 “Muse” is a fairly straightforward word generator. Hit the button and it spits out a nonsensical description of…something. I got “extravagantly narrow-minded bananas” on my last try. If you just want to adjust parts of the phrase, you can tap individual words to change them. By changing the “Mode”, you can adjust how many words are generated and what kind they are, although it’s not the easiest thing in the world to customize. Also, for some reason, the numbered Modes don’t come in a clear order, so you skip from Mode I to Mode III and then V, with no explanation of what happened to poor Modes II and IV. “The Daydream Machine” is sort of like reading through fortune cookies written by stoned monkeys. It’s all pithy Confucian phrases that may or may not make sense, but they’re designed to sound more profound than funny. This was probably my least favorite of the three, partly because the interface was more finicky and slow to respond than the instant gratification of the others. In general, though, I did like the interface, as it was elegant and clean, while still maintaining its “artistic” sensibilities. I also liked the customizable word bank, where you could insert your own words or characters, while also selecting which of their preset groups to include. Although the App Store description is a little heavy on the woo, the app itself doesn’t push a lot of tortured philosophy down your throat. It just provides a sophisticated and entertaining creative tool. At $3.99, it’s definitely pricier than paper slips in a hat, but if you thrive on the power of random suggestion, Inspiro is definitely one of the more attractive and powerful random idea generators out there. AppSafari review of Inspiro was written by Tracy Yonemoto on October 28th, 2010 and categorized under App Store, Education, iPad apps, Productivity, Utilities. Page viewed 3242 times, 2 so far today. Need help on using these apps? Please read the Help Page.